A firm producing fibre mouldings for the automotive industry made use of a number of fibre pulp header tanks, pressurised to ensure a constant flow to the pulp presses. As the level of pulp in a tank was replenished, air pressure rose until a pre-set limit was reached, at which point the pressurised air was released to the atmosphere through a 50 mm port. This discharge contained moisture and, occasionally, some pulp from the header tank. 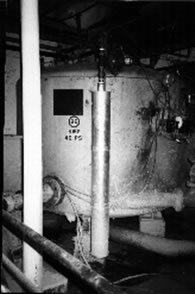 The tanks were located in working areas of the factory, exposing employees every 10 minutes to A-weighted noise levels of about 101 dB for about 3 to 4 seconds. removable end connections via a British Standard Pipethread to enable periodic internal cleaning. Photographs courtesy of Marley Automotive Components Limited. Equipment designed by Ian Sharland Limited.